The winners of the Family Dish Cookbook have been emailed… Jennifer, Elaine, Tammy, Diane and Beth. I’ve only heard from 3, please check your email. 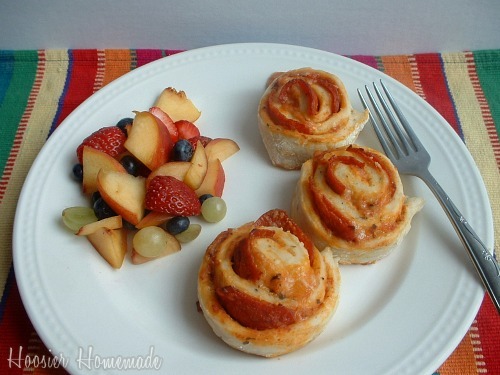 Make pizza rolls for your family tonight! Recipe from HoosierHomemade.com. Add ingredients to your bread machine, according to your manufacturer and set to the machine to the dough cycle. This usually takes about 1 1/2 hours (on mine). When the machine beeps, remove the dough. Roll dough out onto a floured surface,(you may need to kneed it some) into a rectangle. Cover with sauce, then pepperoni and then cheese. Roll up dough, jelly roll style (long end) and slice into pieces about 1 inch thick. Place onto greased cookie sheet or pizza stone. Bake at 350 degrees for about 10 minutes or until golden brown. Have you seen my current giveaway? Fun Hanes Breast Cancer Awareness goodies! While you are there…grab the recipe and directions for these cute these cupcakes! And speaking of cupcakes…tomorrow is Cupcake Tuesday!! Stop on back for some “Spook-tacular” Cupcakes. For more Halloween ideas, visit the All-Halloween Bash over at Blog Party or the Seasonal Celebrations Community on Blog Frog!! I’m linking to the Blog Parties in my footer, please visit them! You might just find one or two that are new to you! The Pizza Rolls look great! I don’t have a bread machine, but I will try and make it without, they look too yummy to pass up! I love the pizza roll recipe. Thank you. I will have to try it. Also, those Pink Cupcakes are GREAT. I am heading over there next. Your menu looks great. I really love the little pizza rolls. I get your email and I have you on my sidebar. You have a great blog. Thank you so much! I’m just thrilled that you like my blog! Those pizza rolls look awesome!! I’m going to try that taco ring! What a great idea! Looks like a great week! 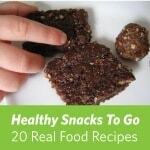 I think Whats Cooking always has great ideas for healthy and kid friendly recipes. What a great idea! I made something similar a few weeks ago, only I didn’t slice it before I baked it. I will have to try this! Hurray! I hope you love the Corn Doggies – they are delish! ps. 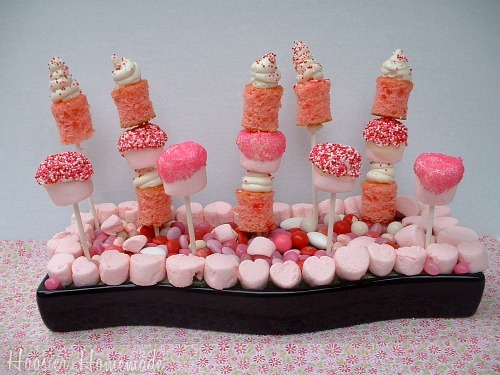 Love the pink marshmallow extravaganza you made! The taco ring sounds like a fun twist to a taco bowl…much easier. I have made many rings over time, but never this one…thanks for sharing. 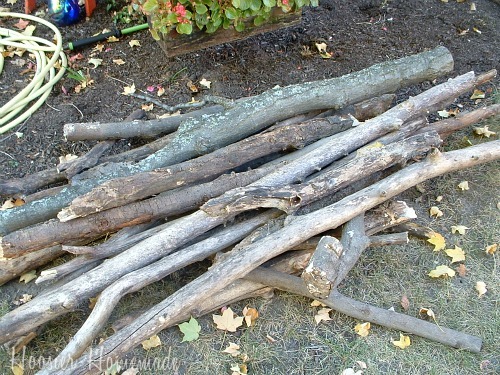 You’ve got my curiousity peaked about the logs…will have to check back to seem how this pile transforms. I love this idea! I have been wanting to make pizza rolls of some sort for a long time now, but I strayed away from them since one attempt did not work out. This looks much easier – and yours look so yummy! Pizza is my biggest weakness, so I really need to make it from scratch more often!